Trumba Support frequently receives the following questions. If you have a question that isn't answered here, try the See Also links on the left. Can I hide event registration? I sent reminder messages to people I invited to my event. Why didn't their messages include Register buttons? Why am I getting a Web Link [email] doesn't look like a web link [email address] error message? What's the difference between repeating, multi-day, and ongoing events? Can I use non-English languages in my events and fields? Can I attach files, such as PDFs and Microsoft® Office Word documents, to my events? Why is there an asterisk beside one of my calendar names? Should I make images the right size for my spuds before I upload them? Once I've uploaded an image can I edit it? How do I find the URL for an image stored on Trumba servers? I made changes to my events and/or spuds. Why don't I see the changes on my website? How do I reorder calendar views in the View Chooser? How do I make my calendar look good on mobile devices? Can I present my events as digital signage? I have too few events for a full calendar but I still want to promote them. What can I do? Can I use custom fonts in my spuds? How do I organize calendar events by start time? In spuds, I'm seeing miles as the unit of measure. How do I change that to kilometers? Why doesn't the description display properly below the event title in Table calendar view? Some people on my distribution list are not receiving my calendar or event emails. Why? In my distribution list, I see red email addresses with two exclamation points. Why? In my distribution list, I see red x's beside email addresses. Why? Some events appear twice in my calendar emails. How do I stop that from happening? Why are future events not showing up in calendar feeds? Can I provide direct links to event action/registration pages? Can I provide direct links to event detail views? Can events in promotion spuds link to event action/registration pages? When visitors add my events to Google calendars, the notes get truncated. How can I prevent that? When I click an event title in a promotion or calendar spud, I see a "Sorry you may not have permission..." error instead of the event detail view. What can Publisher account holders do that Editor account holders can't? How can I stop receiving email from Trumba Connect? Yes, you can choose to hide event registration for events on a particular calendar in Calendar settings, which may be helpful if your organization uses another system for registration and you don't want to confuse your event editors. Only new events, created after hiding event registration, are affected by this setting. For existing events, editors can still view and modify registration details, but can't enable registration on other events. Go to Calendar settings on the calendar for which you want to remove event registration. The Event Registration tab will no longer appear for new events created on that calendar. When it comes to sending event reminders, you have two options. The option you choose determines whether or not the reminder message includes a Register button. While, for many events, you'll end up using one option or the other, it doesn't have to be either/or. There are cases where you might want to take advantage of both reminder options for the same event. The important thing is to be aware that you have two options and what the differences are between them. You set up both reminder options in the editing environment using tabs on the Add/Edit Event form that you open by clicking Add Event or the description of an event you already created. Option 1: Event Registration tab reminders If you set up event registration and invite people to register for an event, you can send a reminder from this tab that reaches only the invitees who have not yet responded to your invitation. This reminder message includes a Register button. Tip You can also create custom reminder messages from the Event Registration tab and send them only to selected registrants. Learn more. I'd like details for how to set up event registration reminders. Option 2: Event Email tab reminders On this tab, you can set up general event announcements and reminders. These messages have no connection to event registration. This gives you the opportunity to announce and remind people about events for which they do not necessarily have to register. Reminders you set up on this tab are sent to everyone on the event distribution list. These messages do not include Registration buttons. Tip You can include the equivalent of registration buttons in general announcements and reminders by providing direct links to event action/registration pages. Learn more. I'd like details about how to send announcements and reminders from the Event Email tab. To help you see how you might use one or both of the reminder options, three events are described below. Set up an event distribution list with the invitees' email addresses. Send invitations to the distribution list. After five days, follow up with the invitees who have not responded by sending an Event Registration tab reminder. Three days before the event, remind all invitees who have registered about the event by sending a custom message from the Event Registration tab. Set up an event distribution list with the target audience members' email addresses. To inform the audience about the event, send an Event Email tab announcement to the distribution list. To encourage attendance, schedule two Event Email tab reminders that are sent automatically to the distribution list three days before and one day before the event. Both options An event for which anyone can register using open registration; a target audience whose attendance you want to encourage. To inform the target audience and encourage registration, send an Event Email tab announcement to the distribution list that includes direct links to the event actions/registration page. To remind the target audience that the registration deadline is approaching, send an Event Email tab reminder to the distribution list five days before the event that includes a direct link to the event actions/registration page. Three days before the event, thank selected high-profile registrants for registering provide them with additional event information by sending them a custom message from the Event Registration tab. If the URL or email address looks perfectly valid and you still see the error message, the problem is almost always an extra space at the end. Click in far right of the Web link or email field, and then press Backspace. Click outside the field. The error disappears. The terminology around repeating vs. multi-day vs. ongoing events can be confusing. If a multi-day event takes place over the course of several days, doesn't it repeat? Isn't it ongoing? What's important is to understand how Trumba defines, implements, and displays these three types of events, and how to set them up so that you get the results you want. Repeating events, such as classes, meetings, and lap swimming hours, can be of any duration, even spanning multiple days, that occur multiple times according to a repeating pattern. Repeating patterns don't have to be regular and predictable. For example, events can repeat on different days each week or not every day, week, or month. They can even start and end more than once on the same day (see Set up special repeating and multi-day cases). Ongoing events are single events, such as art exhibits or final examination period, with an all-day duration, that span multiple days. The start time for ongoing events isn't what matters. For example, an art exhibit takes place in a museum that has standard opening and closing times for different days of the week. During the final exam period, students have several exams at different times. Multi-day events are single events, such as conferences and workshops, of any duration, that occur over multiple days. A multi-day event can have one start and end time each day, the same start and end time each day, or different start and end times each day (see Set up special repeating and multi-day cases). In this way, "multi-day events" that have an all-day duration are also "ongoing events." Support for UTF-8 character encoding is built in to Trumba Connect. In all of the fields where you provide text, you can type non-English characters, including double-byte characters typical of many Asian languages. This means that you have a lot of leeway in tailoring your calendar visitors' experiences to reflect the languages they speak. Note While you can use non-English characters in text you provide, there are many Trumba Connect user interface elements that will always be in English. I'd like to see examples of non-English languages in use and some tips on using them myself. While you can't actually attach or upload files to, or embed files in, events, object (directory) records, or emails, you can link to files from all of those places. Visitors who click the links can download, open, or view the linked files. The easiest way to link to files is to store the files in a Google Drive account, and then use the HTML editor to set up the links. Where can I learn more about linking to Google Drive files and using the HTML editor? An asterisk next to a calendar name indicates the primary calendar for an account. The primary calendar is a system calendar that stores account data. 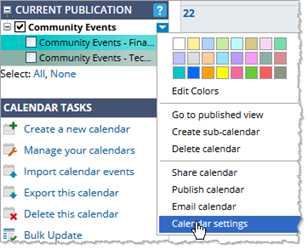 You can add events to, share, and publish primary calendars. However, because the primary calendar stores account data, you can't delete it. Depending upon what type of Trumba account you have and when the account was created, your primary calendar may be called the Internal Event Actions Calendar and it may be hidden. If your primary calendar is hidden, leave it hidden. How do I hide a calendar? In events or event detail views, the best approach from a quality perspective is to upload images at their original sizes. When you set up your calendar views, event detail views, promotion spuds, calendar emails, and RSS and Atom feeds, you can specify the size of the images in each spud. When the spuds display, your original images are resized dynamically to reflect the settings. Image settings for a promotion spud. 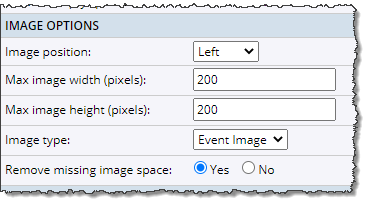 In event and object Notes and other multi-line text fields, size the image appropriately before you upload. As a custom paging or registration button or event action icon, size the image appropriately before you upload. If an image you upload for use as a button or icon is wider or taller than 55 pixels, Trumba scales the image to approximately those dimensions. Note There is a limit to the size of images you can upload. That limit is 1 megapixel, which is equivalent to an image with a width and height of 1000x1000 pixels. Where can I learn more about adding images to events? I'd like more information about customizing spuds, calendar emails, and feeds. I'd like more information about customizing registration buttons and paging buttons and other icons. Yes. In the Update Image window, you can open a third-party image editor called PicMonkey. With PicMonkey, you can resize, crop, or rotate an image, change its exposure and color saturation, and more. Get help with PicMonkey. To edit an uploaded image, open it in PicMonkey. Note PicMonkey requires Flash. For more information, refer to the PicMonkey Blog. You can link to images you upload to your images tables. Each image is stored on the Trumba servers and has its own URL. In the editing environment, click the name of the calendar that owns the image. At the top left corner of the window, click the Images tab. Find the image you want to link to. Right-click the image. What you do next depends upon the browser you're using. In Chrome, select Copy image URL. In Firefox, select Copy image location. In Internet Explorer, select Properties. In the Properties window, copy the URL provided in the Address field. Paste the URL in the location you want to link from. I'd like more information about image tables and storing and managing images. I made changes to events and/or spuds. Why don't I see the changes on my website? 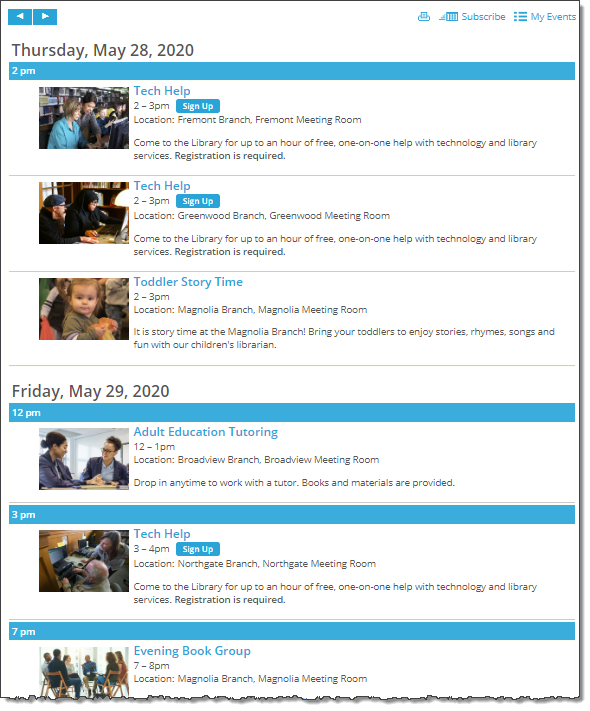 If you make and save changes to events and/or spuds and you see those changes when you preview in Trumba Connect, the changes will appear on your live site. You don't have to re-embed the spud code. Wait ten or so minutes (sometimes a little longer if you're testing spuds on a staging site) and refresh the webpage. Be patient. There is a short delay between when you save changes in Trumba Connect and when they go live. Click the previous and next paging buttons. Change views using the View Chooser. Click a different date or month using the Date Finder. Switch to a different month using the Month List. If refreshing doesn't work, clear your browser history (sometimes called the cache) or try viewing the changes using a different browser. Spuds sometimes get cached. That is, a version of the webpage containing the spuds gets stored on your local computer so the browser can open it more quickly than it could by returning to the original webpage. By clearing the cache, you get rid of the outdated versions of the pages that contain your spuds. Not sure how to clear a browser's cache? Each browser handles this a little differently. Check Help for the browser you're using. The order in which calendar views appear in the View Chooser control spud is determined by the order in which the views are listed on the Calendar Spuds tab in the Publishing Control Panel. In the Publishing Control Panel, click the Calendar Spuds tab. Under Available Calendar Views, find the view you want to move. Click the up or down arrow until the view is in the order you want. I'd like more information about the View Chooser spud. Whether you've done nothing to make your website mobile friendly, fully implemented a mobile-responsive site, or created a separate site for mobile users, you can optimize your Trumba calendars for mobile. For each calendar you publish, the Calendar Spuds tab in the Publishing Control Panel automatically includes a Mobile Table spud. The Mobile Table's calendar and event detail views are designed to reflect best practices from existing mobile-optimized Trumba calendars. Mobile Table view is similar to the Classic Table main calendar view except that the mobile view's default settings focus on keeping the calendar width small. For example, by default, Mobile Table view shows only each event's start time, start date, and description, hides some event and calendar actions, and uses the small versions of paging buttons. Just as with other calendar views, you can customize the mobile view's default settings to meet your specific needs. If you have a separate mobile website, you can embed the Mobile Table spud into a page on that site. Otherwise, you can set the auto detect mobile option for your main calendar spud. With that option set, the device viewers are using automatically determines which view they see. Filter spuds also automatically detect the device on which they're being viewed. Multi-select filters automatically convert to space-saving single-select versions on mobile phones and tablets. I'd like to learn more about the Trumba mobile options and filter spuds. What calendars should I look at for good examples of mobile views?. You can promote your current day's or week's events in your lobby or other high-traffic location by customizing promotion spuds to create effective digital signage displays. To provide event-driven digital signage, all you need is a computer monitor or other device that displays HTML-formatted content and a promotion spud customized to make event information visible at a reasonable distance. I'd like to know which promotion spuds to use and how to customize them. 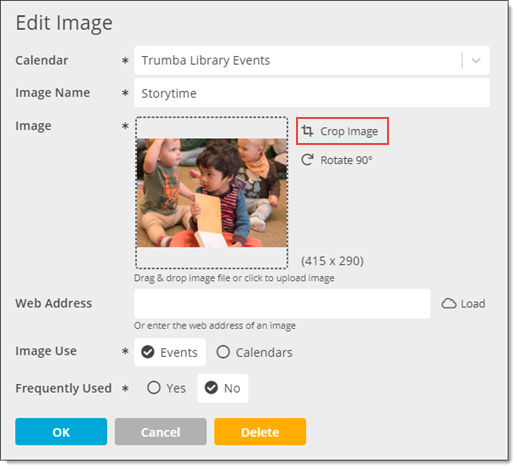 Tip If you have a digital signage system that does not display HTML-formatted content, you can generate a display from one of the data feeds that Trumba automatically generates for every calendar you publish. To provide a developer with the feed URL, follow the instructions described in Publish your events in a mobile app. If you want to promote your events without setting up and embedding a full calendar, you can use a promotion spud as a calendar. OK. I know what promotion spuds are. Just show me the high-level steps. Promotion spuds fit easily into any webpage and can be customized to reflect the page branding and design. You can include images and date icons in promotion spuds. One spud, the Event Slider, presents your events as a scrolling slide show. If some of your events require registration, you can include sign-up and wait-list buttons in your promotion spud events lists. I'd like to know more about date icons and event sliders. I'd like more information about how images work in promotion spuds. How do I add registration buttons to promotion spuds? 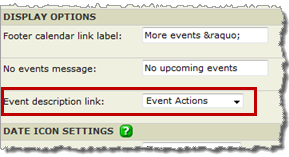 Typically, visitors who click an event title in a promotion spud open an event detail view in the full calendar. But, if you're not publishing a full calendar, there is no event detail view for the links to open. That's why we give you the option of setting event title links to open event action pages instead. Visitors can use the event action pages to add events to their personal calendars, set up reminders, and more. In the detail view (upper left), clicking Back to Previous View (1) takes you back to the full calendar. On the action page (lower right), which has no link to the main calendar, you can add the event to the personal calendar you use (2). Or, you can set up a reminder, ask to be notified if the event changes, and take other actions (3) with the event. Note If an event requires registration, visitors who click the description link open a registration-specific event action page where they can sign up to attend. I'd like more information about event registration. In the editing environment, create a calendar and add events you want to promote. Even though you don't intend to embed a full calendar, you have to publish the calendar in order to create the promotion spud you do want to embed. On the Publish Settings page, click Ok. In the Publishing Control Panel, click the Promotion Spuds tab. In the upper right corner of the tab, click Add a Promotion Spud. On the Add Spud page, select the spud you want, and then click OK. Tip If you aren't sure which spud to choose, click Preview beside each spud thumbnail. This gives you an idea of how a spud looks with its default settings and styles. On the Edit Settings page, on the Settings tab, in the Display Options section, for Event description link, select Event Actions. On the Styles tab, in the Footer section, for Display, select hide. On either tab, select or modify other settings and styling options to make the spud look the way you want. Tip As you change settings and modify styles, preview frequently (by clicking Preview at the bottom of the form) to see the results. Customization tips for promotion spuds. When you're satisfied with the preview, at the bottom of the form, click OK. Copy the embed code and paste it into the proper location on the webpage where you want to promote events. How do I embed spuds? Tip If you enable popups on the promotion spud you're using as a calendar, you most likely want to hide the More Info link that appears by default in the popup and links to a full calendar. Learn how to hide that link here. I'd like to know more about promotion spuds?. I'd like to know more about event actions. How do I set up open event registration? Yes. You can use custom fonts by linking to a font family provided by a web-based font service, such as Adobe® Typekit, Adobe Edge Web Fonts, and Google Fonts. To set up custom fonts for a publication, paste the font tag you copy from the font service into a custom font script field on the Trumba Edit Global Settings page, and then add the font-family name to the appropriate font fields. For specific details, see Spud style settings. If your organization typically offers lots of events each day, you may want to organize the events by start time. You can control the format of the start time header to match the time formats used in your events. In calendar views that support grouping, such as this List view, you can organize events by start time. Tip To organize events by start time and control the start time format, you must be using one of the following calendar views: List, Compact List, Labeled List - Date, Labeled List - Title, Detail List - Date, Detail List - Title, Photo Events. The following procedure assumes you already published your calendar and selected a list-type calendar view. I need help publishing my calendar and selecting a calendar view. In the Publishing Control Panel, on the Calendar Spuds tab, find the calendar view you want to modify. Click Edit Settings & Styles. On the Edit Settings... page, on the Settings or General Settings tab, in the Grouping section, for Group by, select the primary category into which you want to group events. For example, if you have lots of events per day, you might want to group by Day. For Subgroup by, select Start time. Settings for grouping events by start time. Tip When you group events by start time, ongoing and all day events have start times of 12 am. You can hide ongoing events by clearing Include events that started in the past in the Grouping section of the settings form. In the Group Header Format section, select the date, day of week, and time formats you want to use. Typically, you'll choose formats that match the date and time formats you use in your events. At the bottom of the form, click Preview to make sure the settings work the way you want. When you're satisfied with the results, click OK.
For more about paging and grouping events in calendar views, see Mix-ins, paging, and grouping. In the editing environment, make the publication active for which you want to set the unit of measure. Click Publish. In the Publishing Control Panel, on the Publish Settings tab, click Edit Publish Settings. In the Publish Settings section of the form, select the unit of measure you want to use. Unit of measure settings are reflected in the Location Search spud. Why doesn't the event description display properly below the event title in Table calendar view? If you used the Description field to add a description to your events and you set up the Table calendar view to display the description below the event title, your published calendar view should look something like this. I'd like to know more about event fields and calendar views. Don't see the notes in the published calendar. See the notes twice for each event. Confirm that you set inline notes to display. 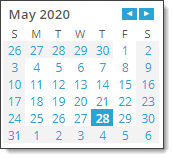 In the Publisher Dashboard, on the Calendar Views tab, find the Classic Tableview. Click Edit Settings & Styles to open the Edit Settings... form. On the Events tab, in the Inline Notes section, for Display inline notes, select Yes. Confirm that the event title is included in the field list. On the General Settings tab, in the Display Settings section, look for Description in the field list. If it's not there, use the drop-down [add new field] list to add it. At the bottom of the Edit Settings form, click Preview to see how the eent description looks below the event title. If you see the description twice for each event it means that you included the Description field in the calendar view field list and set the description to display below the event title. To solve the problem, remove the Description field from the field list. In the Publisher Dashboard, on the Calendar Views tab, find the Classic Table view. Click Edit Settings & Styles to open the Edit Settings... form. On the General Settings tab, in the Display Settings section, find Notes in the field list. In the Remove column on the far right, select the check box, and then click Update. Notes disappears from the field list. At the bottom of the Edit Settings form, click Preview to see how the description looks below the event title. The first thing to do is confirm that you have the people's email addresses entered correctly in your distribution list(s). If the email addresses are correct, it's likely that the recipients' Internet Service Providers are treating Trumba email messages as spam. You can provide recipients with information about how to get Trumba added to the ISPs' whitelists. A red email address with two exclamation points is an address to which Trumba tried to deliver email and failed. This could mean the address is invalid or that email from Trumba is being treated as spam. How do I remove invalid addresses from my distribution lists?. Can I increase the likelihood that my calendar and event emails will not be treated as spam? If you know that a flagged email address is valid, you can provide the address owner with information about how to get their Internet Service Provider to stop treating Trumba email messages as spam. And, you can contact Support to get the red flag removed from the valid addresses. A red x beside an email address indicates that the email address owner opted out of receiving email messages sent from the current calendar or from Trumba in general. How do I remove addresses from my calendar distribution list? If you offer events that span midnight, you have to set your calendar's day display times to reflect that span. Otherwise, events that span midnight will show up in calendar emails both on the day they start and on the day they end. In the editing environment, click the calendar's name to make it active. Click Settings above the calendar. In the Calendar Settings form, in the Display Options section, set Day display ends at a time that is past midnight. After you change the day display settings, send yourself a one-time calendar email to confirm that events that span midnight appear in the emails only on the day they start. Where can I learn more about modifying my calendar email settings? By default, a calendar's RSS, Atom (XML), iCalendar (ICS), Comma Separated Value (CSV), and JSON feeds show six months of event information starting from the current day. With these defaults, if your future events are more than six months away, they won't show up in the feeds. 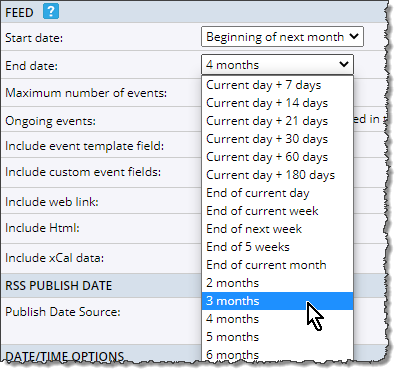 You can change the default setting by changing the start and end dates for events that you want your feeds to include. Changing the default start and end dates for events in a feed. To change feed settings, in the Publishing Control Panel, click the Feeds tab. For the feed type you want to customize, click Edit Settings & Styles. I'd like more details about customizing feed settings. Can I provide direct links to event actions/registration pages? You can encourage a targeted audience to register for and/or attend an event by providing a direct link to the event's Event Actions page. To encourage attendance, you can provide direct links to event actions pages like this one. For any existing event on a published calendar, you can find an event actions link by opening the event in the editing environment and scrolling to the bottom of the edit event form. You find the event actions link URL toward the bottom of the edit event form. Tip Be sure to test the event actions link. The URL is based on the current publication selected in the editing environment. That publication's settings determine the appearance of and the fields and actions included in the event actions page. If the page doesn't look the way you expect, you probably need to switch the current publication. I'd like detailed steps for finding and copying the event actions URL. Downloading a QR code image file for use online or in print materials. Clicking the icon opens the QR Code window where you can copy a link to the event detail view (Address) and/or download a QR code image file. 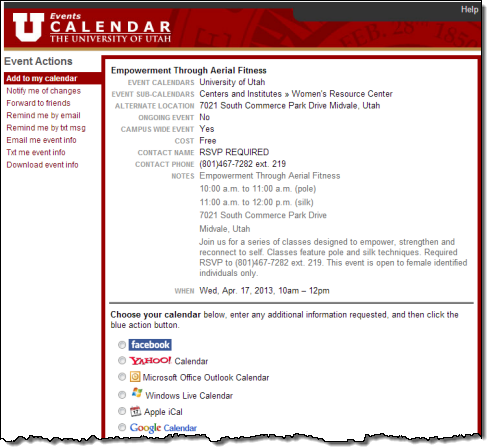 Tip Event detail links remain valid until you delete the event from or unpublish your calendar. Do other views have permalinks? Can I create my own URLs to filtered views, search results, and more? You can set up a promotion spud so clicks on event titles open the event action/registration page rather than the event detail view associated with the main calendar. If you decide to use a promotion spud instead of a full calendar to promote events, this is a step you want to take. Note The following instructions assume that you already published a calendar and added the promotion spud you want to embed in your website. If you need more detailed steps, see I have too few events for a full calendar but I still want to promote them. What can I do? In the editing environment, display the appropriate calendar, and then click Publish. In the Publishing Control Panel, click the Promotion Spuds tab. Find the promotion spud with settings you want to change, and then click Edit Settings & Styles. On the Edit Settings... page, in the Display Options section, for Event description link, select Event Actions. At the bottom of the form, click Preview to preview the spud and test the event title link. Notes get truncated because of a limit that Google places on the overall size of URLs used to add events to calendars. A URLs size is determined by all of its parts, including the domain, page, field names, field content, and more. If a particular URL exceeds the size limit, the Description field content is what gets truncated. Testing has shown that, if you keep the combined size of an event's fields to about 500 characters, all of the content you add in Trumba should show up in the Google Calendar event. Tip If an added event includes custom fields, in Google Calendar, this custom information is added at the top of the Description field. This means that Trumba Description field content will be truncated before custom field content. 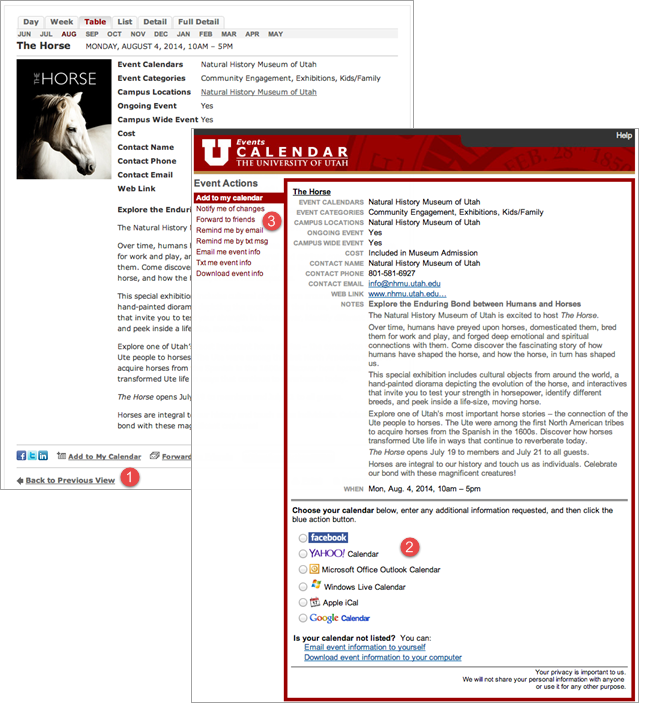 Publishers can mark events as private only on calendars they own. Learn more. By default, editors cannot create calendars in their accounts. Learn more. Tip Editors with accounts created before April 10, 2013 can create calendars in their accounts. To disable calendar creation in these accounts, contact Trumba Support. Note Publishers can share fields, templates, and objects for use by Editors. Tip Editors with "Add, delete, and change content" permission for a folder can edit custom object records. Note Publishers can share custom forms for use by Editors.